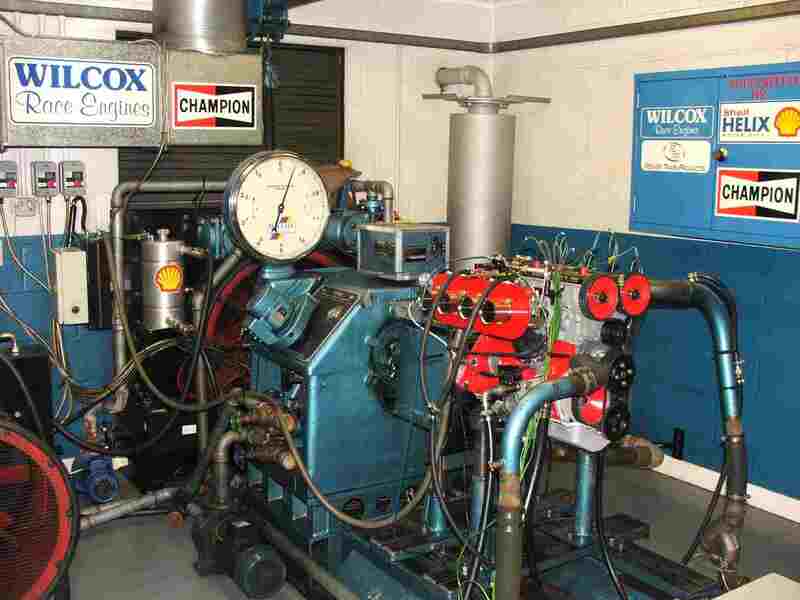 Engine Dyno testing, John Wilcox Competition Engines. 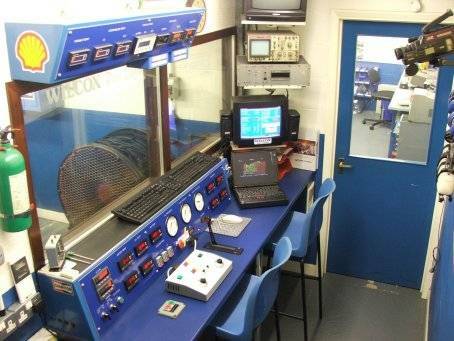 True engine development can only be carried out with an engine dynamometer in a controlled environment. 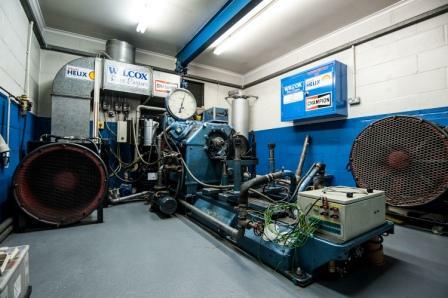 Our in house Dyno facilities include three engine dynamometers and a rolling Road. Each custom built cell is equipped with comprehensive instrumentation, computer control and data acquisition. A wide range of sensors and probes monitor the engines every beat, together with extensive cooling facilities we can be sure that we are always in full control of an engines running conditions. The ability to record accurate and repeatable data, corrected for atmospheric variations, allows us to test engines and obtain government power certifications for major manufacturers. Computerised data logging allows us to collect far more data much quicker and with the ability to overlay data from previous tests, ensures that even small improvements are not missed. Some of our testing for major manufacturers involves working alongside other companies such as Ilmor Racing Engines, Lotus Engineering & Cosworth. Information can be sent electronically via a modem, for other parties to assess any improvements and discuss any changes to the test programme. Most of our race engines are tested and developed in our 1000bhp/12,000 rpm cell. This extremely versatile cell has allowed us to test a wide range of engines such as V12 jaguars, Ferrari's and most 4 cylinder normally aspirated or Turbocharged engines. Much of our race engine development work involves the testing of new ideas, cam profiles, head modifications and one off inlet & fuel injection systems, using either petrol or methanol fuels. Works touring car teams in the UK and Europe, have taken advantage of our facilities for the development of their engines, Our private customers benefit from the same facilities, allowing us to run in new and rebuilt engines, calibrate the carburettors or to programme the engine management system. The engine is then power tested to ensure that the customers engine is optimised to get the very best from it. A printout of power, torque, and other data on their engine, together with graphs, gives the customer important information which can also help select the correct gear ratio's for the car. 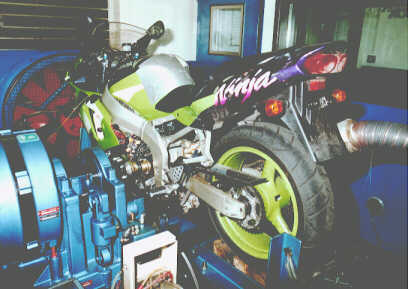 Many installation problems are also avoided as the electronics and wiring have already been tested on the dyno. Dyno 2, With a capacity of 225 Bhp is more suited to lower powered race engines, production engines and for testing motorcycle engines at up to 19000 rpm ! This cell is used by Power Train Projects for the development of the K series engine, as well as Triumph Motorcycles Ltd working from a first prototype engine. Hours of test and development work are involved in testing cam profiles, optimisation of cam timing, cylinder head redesign, intake and exhaust system development. 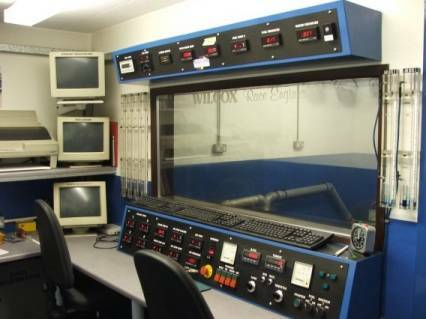 Some of our more specialised test work involves the collection of combustion analysis data, and collection of data to enable computerised engine simulation for use on future engine designs. Before production a new engine must have proven reliability, our extensive cooling and control facilities allow us to perform engine durability tests, where engines can be subject to far harsher conditions than could ever be achieved on the road. As government power certification is also required on production engines, where a independent organisation will spend hours checking and rechecking the calibration of our test equipment, our highly maintained cell ensures that the manufacturers get their power certification, and our private customers get accurate and reliable data. We have recently installed another eddy-current 225 Bhp dyno which further increases our capacity for motorcycle or production engine testing. Another use for this dyno is the ability to test complete bikes on our own designed frame. Simply by removing the chain and connecting directly to the output shaft we can produce accurate and repeatable results. This provides a quick and cost effective way to obtain true crankshaft power and torque curves without the errors associated with rolling roads which can only be used for a rough comparison.